Made in Italy. 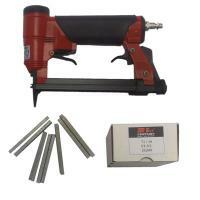 Fine wire upholstery stapler drives 71 type staples up to 16mm. Special Offer - Buy this gun now and we'll throw in 10 boxes of 20,000 71/10 Staples for no extra charge! Includes 200,000 71/10 Staples Absolutely Free! Upholstery, automotive trim, insulation, cabinet, small furniture, shoe making, light trim and moulding, carpet laying, picture frames etc. PVC reinforced air hose with quick connect/release Hi flo coupling and adaptor. Available in 15m or 7.5m lengths.